By now you have probably seen a plethora of pictures of the royal wedding pair. So, how's this for something new and unusual? This picture is being forwarded along via emails and I think it's quite unique. Prince Williams' suit is created from salami and peppers, while Duchess Kate's veil is fashioned from mushrooms. Her dress is made from cheese. According to the chief marketing officer for Papa John's, "it tastes as good as it looks". Now, if you would like to see some serious wedding photos, the British Monarchy's Flickr photostream can be viewed here. 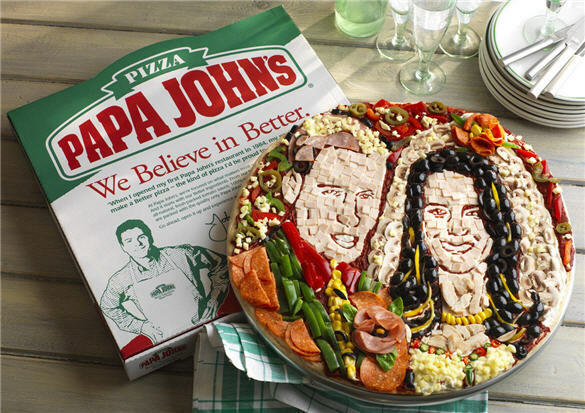 Very creative - you can't beat pizza! Rats! I can't see it. I'll be back later. In the meantime, I'm off to see the Royal pictures. Is isn't there but the description provided a great imaginative visual! Someone was very clever and quite artistic! That is definately the most unique wedding post ever. I love that pizza. .so fun.